Wembley No Alchohol sign A metal Wembley Stadium sign used within the stadium before it was demolished in 2003. From Old Wembley Stadium 'No alcohol beyond this point'. A metal Wembley Stadium sign used within the stadium before it was demolished in 2003. 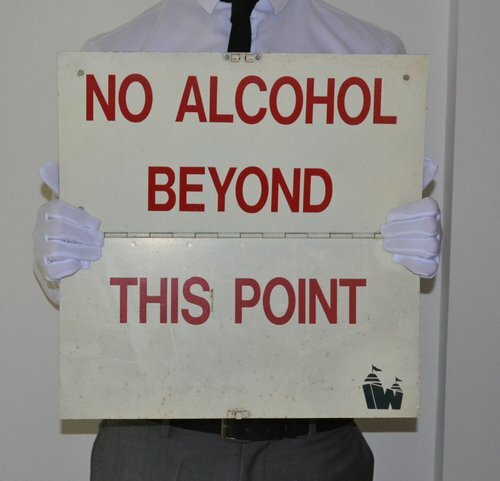 From Old Wembley Stadium 'No alcohol beyond this point'. A metal Wembley Stadium sign used within the stadium before it was demolished in 2003. This is a substantial piece. Approximately 16"x 16" made of metal and hinged in the middle. Comes with a detailed certificate of authenticity.